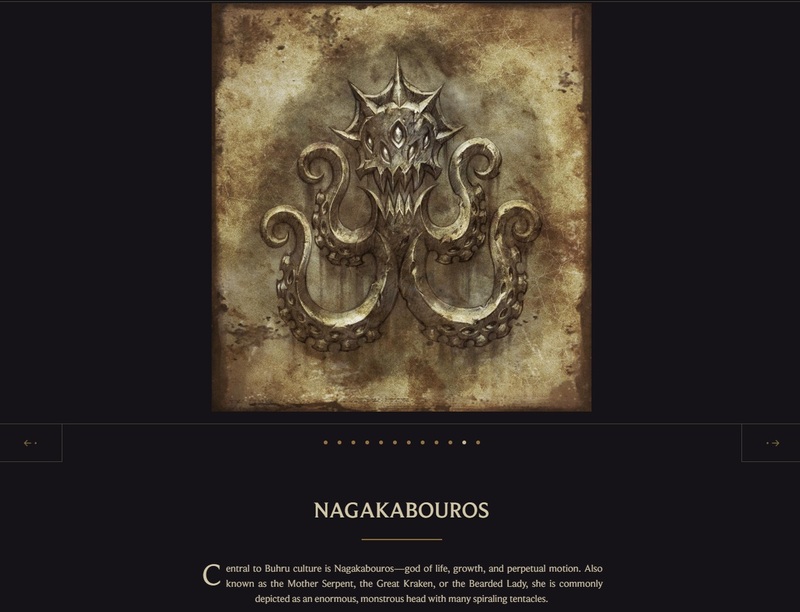 As we sail into the Curse of the Drowned event, the Universe has been updated with Pyke's lore, new biographies & stories, and a six part Legends of Bilgewater audio drama! 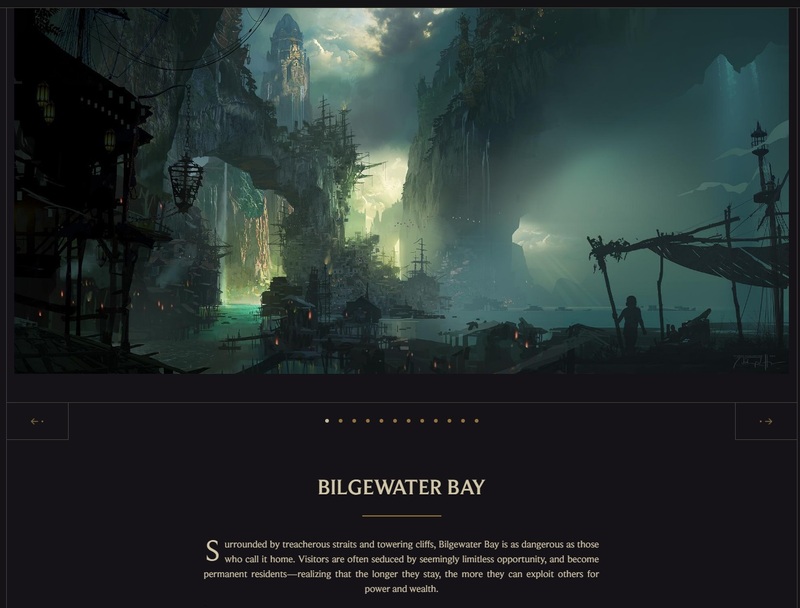 While already a staple on Universe, the Bilgewater region page has been updated with few new concept art to go with the new stories. While incredibly dangerous, Bilgewater is ripe with opportunity, free from the shackles of formal government and trade regulation. 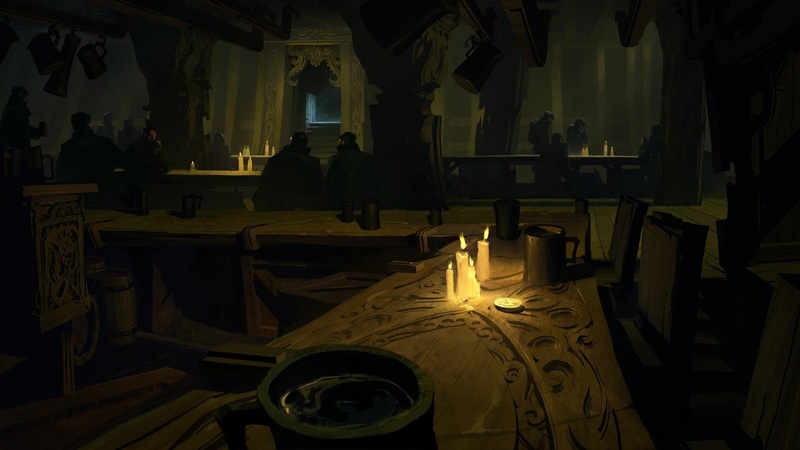 If you have the coin, almost anything can be purchased here, from outlawed hextech to the favor of local crime lords." 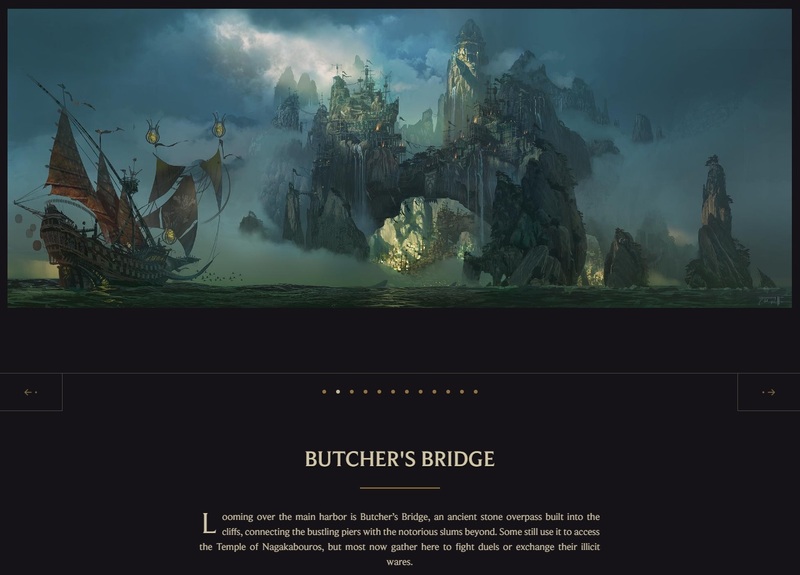 A new six-part Legends of Bilgewater audio drama has also been released, sharing stories about several of Bilgewater's champions. 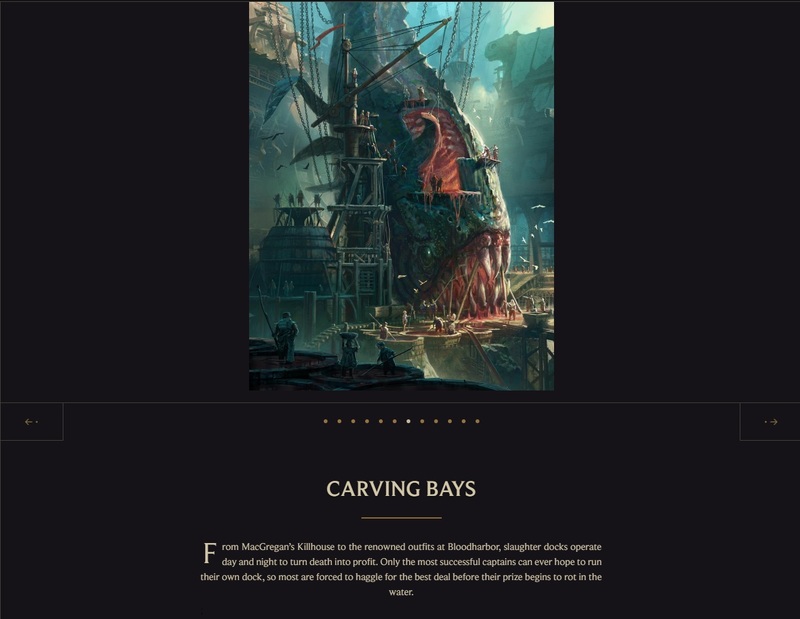 "Listen as Lars spins a tale of four Bilgewater legends - Nautilus, Fizz, Tahm Kench, and Pyke - and discovers the terrifying fact woven into his fiction. Click on the links below for more. 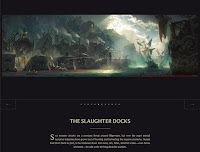 "As a youth, Pyke started out like many in Bilgewater: on the slaughter docks. All day, every day, monstrous creatures of the deep were hauled in for rendering in the butcheries that lined the waterfront. He found employment in a district known as Bloodharbor, as even the tide itself was not strong enough to wash away the red slick that ran constantly down its wooden slips. 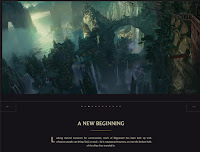 A city that prides itself on hunting monsters now finds a monster hunting them, and Pyke has no intention of stopping." "Mazier is sprawled on the rotten planks, waves lapping at stone underneath. Her slowing heartbeat pumps blood into the seawater. She stares, unblinking, at the shanty-dwellings above, and the stars beyond. That’s it. No more names, just a lot of red crosses. Where did I get all that ink...? Ragged beard in high-sea wind. Dozens of faces on deck. Watching. Crap-brown eyes. Beke Nidd’s crap-brown eyes, wide in disbelief. 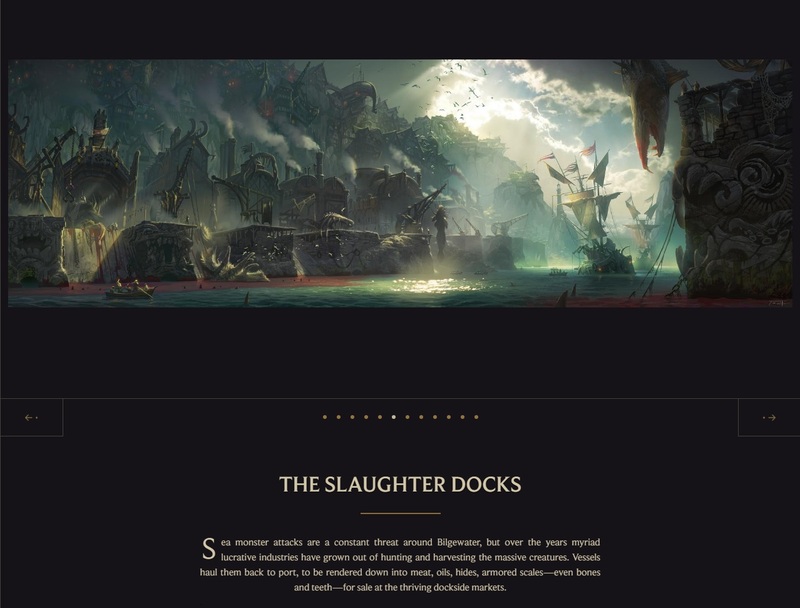 "Bilgewater’s White Wharf had earned its name thanks to the layer of bird waste covering it from end to end, which was only to be expected at a resting place for the dead. Folk here didn’t bury corpses; they returned them to the sea. A grave of the sunken dead hung suspended in the cold depths, marked by hundreds of bobbing grave-buoys. Some were merely name posts, while others were elaborate tomb markers carved to resemble rearing krakens or buxom sea wenches. Miss Fortune sat on an empty crate of Rapture Rum at the end of the wharf, legs crossed and a noxious cheroot dangling from her bottom lip. In one hand, she held a length of breathing tube connected to a half-submerged coffin floating low in the water. In the other, she grasped a length of frayed rope running through a rusted pulley block and tied to the coffin lid. Both her pistols were holstered within easy reach. Moonlight cast a weak glow through the mist rolling in from the sea, staining the water’s scummed surface tobacco yellow. Cawing carrion gulls lined every swaybacked roof on the quayside, which was always a good omen. They knew better than any the signs of fresh pickings. “About time” she whispered, as a shaven-headed man in a drake-scale frock coat emerged from the narrow, debris-choked alley. A pack of needle-toothed wharf-rats stalked him, hoping he was drunk and might pass out to become easy meat. The man’s name was Jakmunt Zyglos, one of the Painted Brothers. Any corsair worth his salt had tattoos, but every inch of Zyglos was inked with clawed serpents, lovers’ names, and a record of every boat he’d sunk, every man he’d murdered. His skin was as good a confession as any she’d known. He marched purposefully along the wharf, but his eyes darting warily from side to side gave the lie to his confidence. 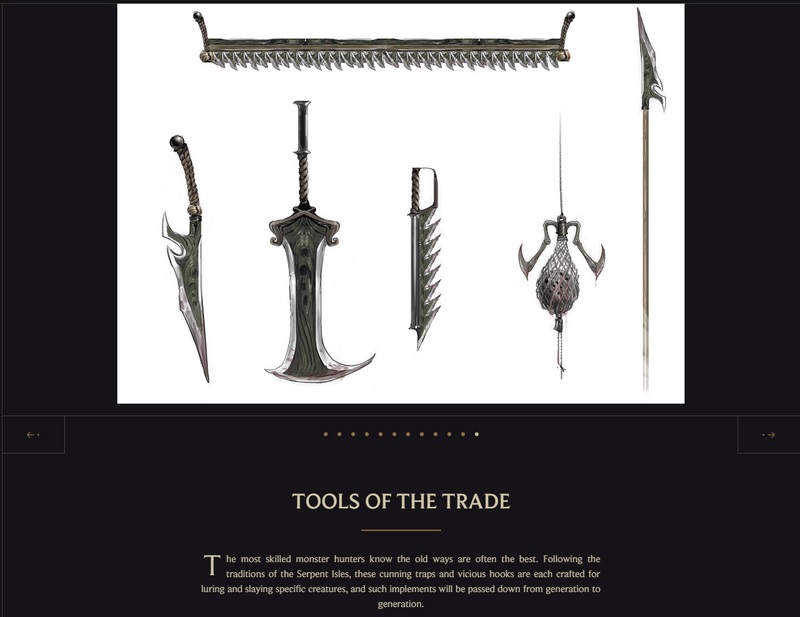 His hand gripped a long cutlass with a shark-toothed edge that hung low on his hip. He too boasted a firearm, a stubby carbine with glassy pipes running the length of its barrel. 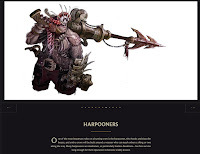 “That a Piltover hex-carbine?” she asked, ignoring his question. Zyglos took a breath, and she saw the tension go out of him. “Yes, damn you, it’s from Piltover” he said, drawing the weapon and holding it out by the trigger guard. “I guess you’d know” he sneered. She let out even more rope. Bubbles of air escaped the now fully submerged coffin. Zyglos held up his hands, instantly contrite. Zyglos gave a bark of fatalistic laughter. “True, but I’ve never been very good at following instructions” said Miss Fortune, releasing the rope and the breathing tube. The coffin plunged into the darkness of the sunken dead, trailing a froth of frantic bubbles. Zyglos screamed his brother’s name and ran at her, drawing his serrated sword. She let him get within spitting distance before drawing her pistols and blasting him with both barrels, one through the eye, one in the heart. Miss Fortune spat her cheroot into the sea and blew the smoke from each muzzle. Miss Fortune bent to retrieve the fallen hex-carbine. She turned the weapon over in her hands. Too light for her tastes, but artfully made and absurdly lethal. The ghost of a smile twitched the corner of her mouth as she thought back to the warmth of the old workshop, the smell of gun oil, and the touch of her mother’s hand on her shoulder. Miss Fortune sighed and shook off the memory before it turned sour. She threw the pistol out over the water, sending it down to the dead. The sea demanded its due, after all, and she’d not lied; the weapon was worth a small fortune. She stood and strolled back into Bilgewater. She knew she ought to throw Zyglos’s corpse into the water too, but the wharf-rats and the carrion gulls had to eat, didn’t they? And fresh meat was a rare delicacy on the White Wharf." "To understand the legend of Nautilus, one must first know the man—for even the tallest of tavern tales agree, he was indeed a man. Sometimes, in the tumble of waves, distant memories of who he was push up above the waterline… but always the man who is Nautilus stays drowned just below the surface." 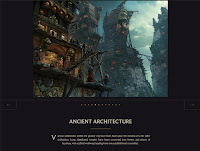 "In ages past, the oceans of Runeterra were home to civilizations far older than those of the land. 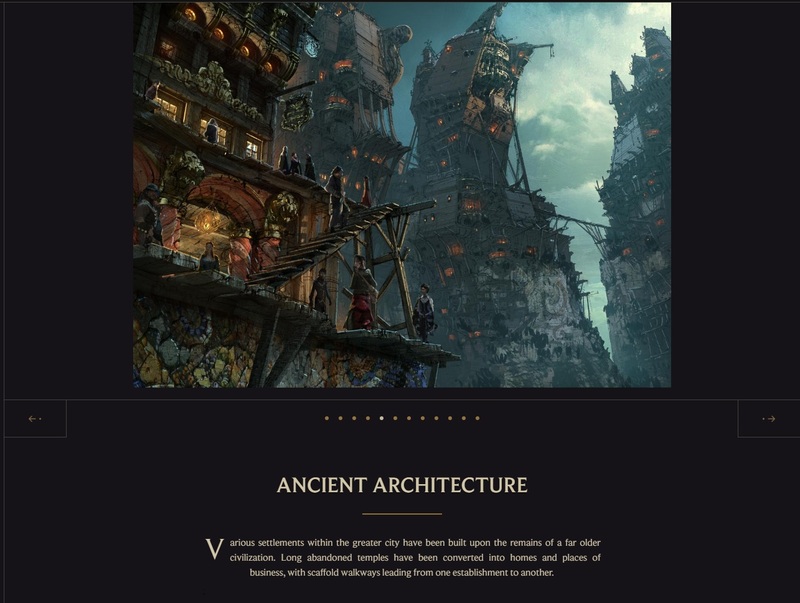 In the depths of what is now the Guardian’s Sea, a great city once stood—it was here that the yordle Fizz made his home. 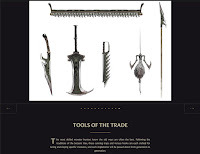 He lived alongside the artisans and warriors of that proud, noble race. Even though he was not one of them, they treated him as an equal, and his playful nature and tall tales of adventures in the open sea made him welcome at any gathering. Fizz is good-natured, but mischievous even for a yordle, and delights in confounding the people of Bilgewater. The most seasoned fishermen know, just as the ocean may rise and fall, the Tidal Trickster is as likely to lead them into windless doldrums as to an easy catch that would fill their nets. 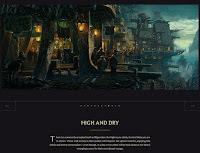 Even so, Fizz does not take kindly to the greedy or selfish, and more than one haughty sea captain hoping to make a quick pile of silver has found that her mysterious guide has led her crew not to safety, but to shipwreck." 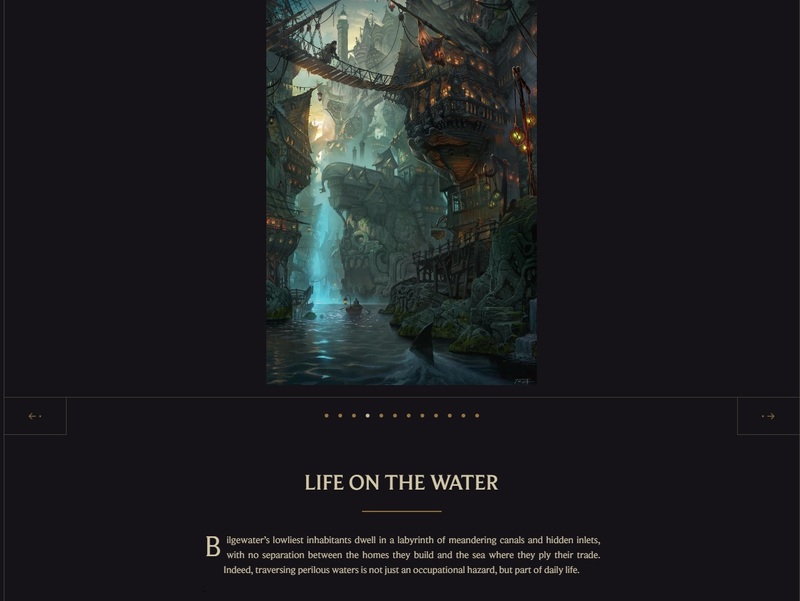 "The waterways of Valoran are old, but far older still is the demon Tahm Kench. 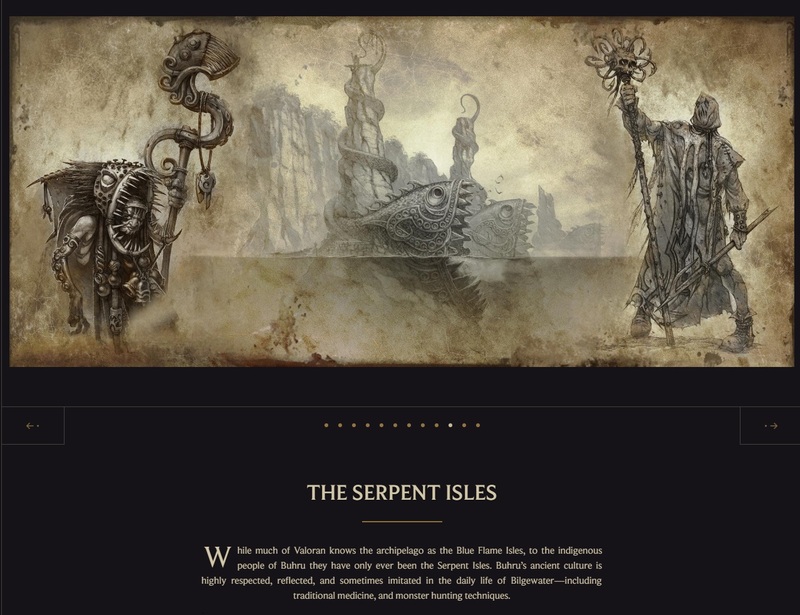 From muddy gambling tents along the Serpentine River, through the salt-crusted dice halls of Bilgewater, to the gilded wagering tables of Piltover and Zaun—all those who have given a covetous glance to another’s wealth know the unending hunger that comes from an encounter with the River King. 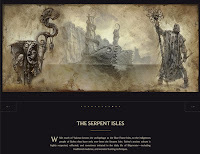 The first tales of the creature were told by a traveling people who plied the Serpentine. They warned of a giant fish with a cavernous mouth, who would lure in the dissatisfied with the promise of more. One such story was that of a young man renowned for his honesty. Though born to the ways of a raftsman, he desired a life beyond the poor banks he knew so well, and the River King promised him an unforgettable experience if only he would tell one little lie. It seemed harmless enough, so the raftsman bent the truth in conversation with his own brother. That night the demon appeared, revealing a fork in the river the raftsman had never noticed before. He followed it to a camp of foreign folk who offered him food and drink, and fresh companionship. As dawn neared, and the raftsman was full and ready to return to his people, the demon appeared again, promising an even greater experience for another lie. His interested piqued, the man accepted the bargain, telling falsehoods to his hosts. The river parted again and he followed it to an evening of even greater luxury. This continued, night after night, until the once-honest raftsman’s deceits came as easily as breathing. When the river finally emptied into the sea, he found himself alone and lost—there was no one left to lie to. So many dark choices, all of them his own, had left the raftsman with no way back home. The brackish rivers of the mainland carried the tales of the River King to the Blue Flame Isles, where the creature gained a name as his legend grew—Tahm Kench. 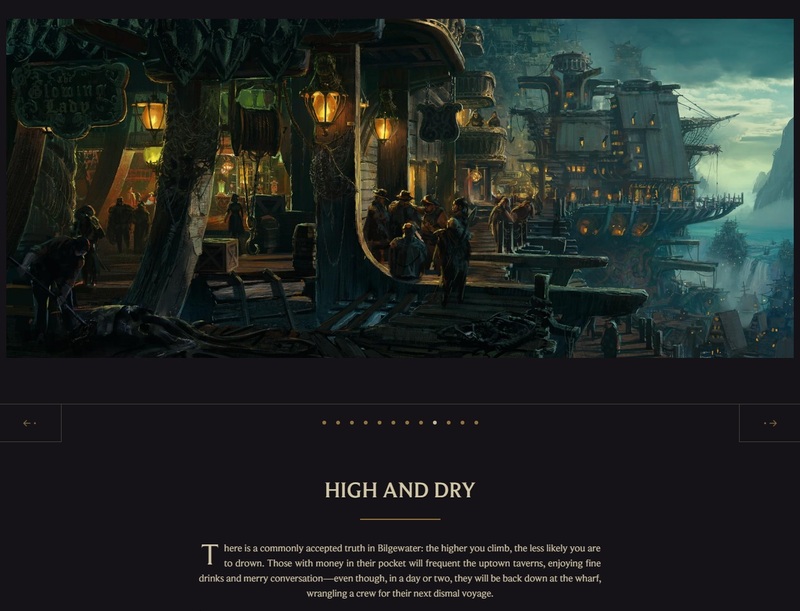 In Bilgewater, fortunes are boom or bust, with as much wealth going out with the tide as comes in. Many a tavern yarn tells of ol’ Tahm, a demon of the water with an unending appetite for games of chance, such that the loquacious beast became a symbol for many of the city’s gambling dens and houses of sin. 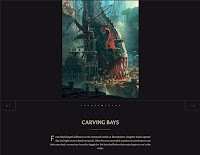 Once the Sun Gates opened easy trade from Bilgewater to Piltover, tales of Tahm Kench became more common in the City of Progress and its underbelly, Zaun. There, children know Tahm as “Two-Coats,” a fish so monstrously large that he wears two fine jackets stitched together. With a jaunty top hat and a smile wider than the Pilt itself, he drives the jealousies of young artificers. It is said he came one Progress Day to a struggling Piltovan inventor, and offered her an idea certain to make a wealthy clan take notice. All he asked in return was a single lock of her hair. The ambitious woman made the trade and, true enough, her work landed her a lucrative contract. But one invention would not satisfy, and Two-Coats wandered by, this time asking for all of her lovely braids. Not wishing to disappoint her new patrons, the inventor agreed—and Two-Coats ate them up on the spot. Still the woman was unable to find the one great innovation that would make her name. The demon came again, offering a deal that would take the tip of one finger. The following week it was an ear. A year passed, and by then there was little left of the woman to give. Finally she called Two-Coats herself, begging him to make it all stop. He laughed as he opened his jaws wide, telling her he would protect her from herself, and promptly swallowed her whole. The River King. The Great Waddler. Old Yawn-Belly. Two-Coats. The demon Tahm Kench is known by many names, but all who speak them have learned a singular truth: no matter how alluring his words may be, in his mouth you will be lost."